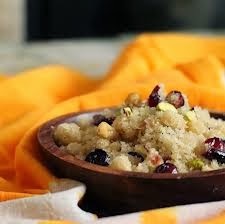 Home » lifestyle » FAMOUS DIWALI SWEET COCNUT SHEERA. Coconut Sheera is a famous Diwali sweet which is fully made up with coconut milk. It is so delicious and tasty sweet which takes just five minutes to prepare and 60 minutes to cook it. The ingredients used are two and half cup coconut cream, one liter of fat milk, half cup sugar, five cardamoms, one-fourth cup of chopped cashewnuts, and ghee for lubricate. First step is to soak the cashewnut for ten minutes in hot water and drain it well. Now, mix the coconut cream and milk together in a non-stick pan in a simmer. Then, add the sugar in the same pan continue to stirr it well till it becomes thickening. Next, add the cardamom and cashewnuts. Mix it well. Atlast, transfer into another bowl and keep it in a refrigerate. Then, serve with chilled to children and all for tasty if you need add ghee for purpose.